Note: Locations above are for weather information only and do not represent plant locations. The history of City Concrete goes back over sixty years and encompasses changes in the name, the location and the size of operation, but the ethics and ideals that are the foundation of City Concrete Company remain constant. City Concrete Company traces its origins to Wichita Falls, Texas, circa 1946. It was then that Thomas C. Foley and his partners Jack D. Foley and John Gavin started the Wichita Sand and Gravel Company. Wichita Sand & Gravel (WS&G) grew by adding manpower and equipment and became the premier concrete supplier to the rapidly expanding oil boomtown of Wichita Falls. 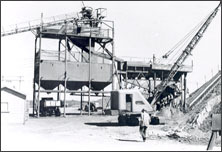 WS&G began operations receiving cement by rail and loading the sacks by hand into the mixer truck. WS&G also had sand and gravel plants and, with the help of the Halliburton Company of Duncan, Oklahoma, reportedly the first pneumatic cement storage and handling facility west of the Mississippi River. 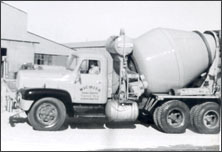 The first trucks used to deliver concrete included used 1942 International R-900 trucks equipped with 2 cubic yard Jaeger transit mixers. In 1960, WS&G was purchased by the Gifford-Hill Company of Dallas, but continued to be operated for a number of years by T.C. Foley and Jack Foley. In time, T.C. Foley and Jack Foley had the chance to purchase their primary competitor in Wichita Falls, the C.C. Pitts Company. Based in Wichita Falls, the C.C. 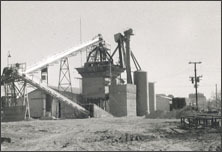 Pitts Company had many ready mix concrete batch plants in North Texas and Southern Oklahoma, including Altus, Lawton, Hollis, Wichita Falls, Burkburnett and Bowie. This purchase created City Concrete, Inc.
City Concrete Company, sold the smaller and mostly unprofitable satellite operations and retained the Wichita Falls plants. In 1972, T.C. Foley sold Plant no. 2, on the north side of Wichita Falls near the then rapidly expanding Sheppard Air Force Base, to longtime friend and business associate, Arthur Litteken. From this sale, the OK Concrete Company was formed and with Mr. Litteken�s guidance, the company continues to thrive today. Around the same time, City Concrete Company moved from the old C.C. Pitts location to a new location with easy access to all of the major arteries in town. We continue to base our operations there today. In 1976, T.C. Foley and Jack Foley sold their interest in the company to Paul and John Foley, sons of T.C. Foley. Paul and John expanded the operation with an interest in a concrete plant in Bowie in 1980 and serviced several other projects with portable concrete plants. Things went very well until the oil bust in 1984, at which time the plant in Bowie was sold and business in general slowed down in much of Texas. Around this time, John Foley left the business for a ranch in West Texas, where he operated in sheep and goat country. In the early 1990�s, Paul�s sons, Tim and Jim Foley joined him in the business. 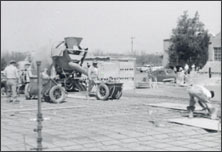 This brought expansion in the form of portable central mix paving plants and a new ready mixed operation in the Rhome/ Roanoke area of Dallas/ Fort Worth. Beginning in the mid 1990�s, City Concrete played a part in large highway and subdivision projects in the DFW area and through the ready mix plant, supplied a great deal of the TxDOT bridge structure concrete throughout the northwest part of the DFW metroplex. Jim Foley manages this area for the company. Continuing a tradition of successful joint ventures with each other, the Foleys and David Litteken of OK Concrete Company purchased the Hope Concrete Company from Gerald Hope in August of 2010. Tim Foley moved to Sherman, and with the help of previous owners Gerald Hope and Mike Corzine, began to operate Hope Concrete Company. In the Summer of 2014, City Concrete Company exited the ready mixed concrete business in the Wichita Falls market. Paul Foley remains the president of City Concrete Company, which continues to support all of the ready mix concrete plants outside Wichita Falls and operate portable batch plants throughout the State of Texas and beyond. Over all these years � one constant remains � our people. What separates us from others is our people, whom are outstanding and continue to operate with the ethics and ideals that T.C. Foley started with in 1946.